Mushroom is a fleshy fungus, typically produced above ground on soil or on its food source. Known as the meat of the vegetable world, the practice of eating mushrooms dates back to thousands of years. Edible mushrooms are used extensively in cooking, in many cuisines mostly Chinese, Korean, European, and Japanese. Commonly "mushroom" is named for the cultivated white button mushroom; hence the word "mushroom" is most often applied to those fungi that have a stem, a cap and gills or pores on the underside of the cap. Edible mushrooms have uses beyond jazzing up your favorite recipe. In addition to being low in fat and high in fiber, mushrooms pack a serious nutritional punch. They are an excellent source of selenium (very important mineral for optimal antioxidant activity), many of the B vitamins, and potassium. In addition, their polysaccharide and beta-glucan components exhibit anti-cancer properties. 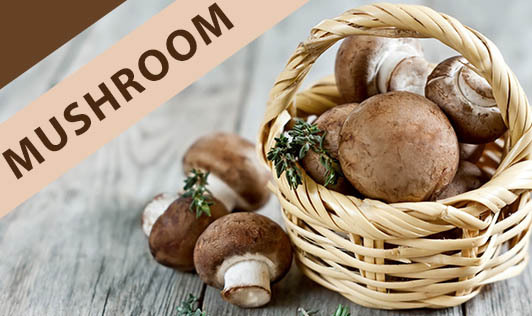 Mushroom is rich in several anti-oxidants (selenium & vitamin A, E, & C), uric acid and vitamin D.
Mushroom is loaded with a potent disease-fighting antioxidant called ergothioneine which helps to boost immune system function and also boosts cardiovascular health. Lowers the risk of cancer due to its anti oxidant properties. Helps fight infection; it has anti-bacterial, anti viral and anti-inflammatory properties. Mushroom's low calorie content is good for weight watchers. Mushroom is probiotic; they help restore natural resistance to diseases. Myth: Mushroom causes allergy to everyone. Fact: Not all are allergic to mushroom, in fact mushroom combats allergy due to its anti oxidant and anti bacterial properties. But there are people who are allergic to mushroom; those of you who are can exclude it from your diet. Myth: The poisonous mushroom will appear to be bright colored ones. Use grilled mushroom as flavorful burger "patties" - no need for meat here. After removing the stems from mushrooms, stuff them with your favorite vegetable medley or soft cheese for delicious stuffed mushroom dishes. People who are not overweight can have delicious mushroom bajjis occasionally.